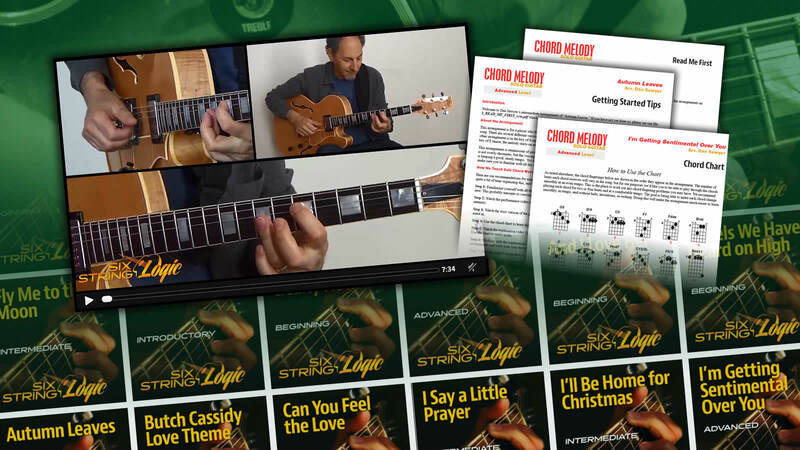 Los Angeles, CA – December 6, 2017 – (GuitarPR) – Six String Logic, LLC has announced the release of 28 new solo guitar chord melody arrangements utilizing its Player-to-Player™ Instruction Format. With a broad array of musical styles supporting all levels of playing, the company is bringing Chord Melody into the mainstream of guitar education. Six String Logic offers complete, downloadable arrangement packages that include a standard set of learning materials, including three printable PDF documents and three (and sometimes four) video tutorials. The package format was developed and refined over a two year period and focuses on “playing to learn.” Each arranger goes through a step by step explanation of how to play the arrangement, including alternate fingerings, right and left hand techniques for performing, and much more. There are no harmony and theory lectures. The goal is always to spend more time playing and less time learning. They call this Play to Learn, not Learn to Play™. Six String Logic offers a straight-forward value proposition. Complete single arrangements are competitively priced. A generous quantity pricing structure also offers substantial discounts when purchasing three or more at the same time. Arrangement packages and more information about Six String Logic’s visionary approach to guitar education at all levels can be found at https://sixstringlogic.com. Six String Logic LLC is a new publishing and education company focused primarily on guitar and located in the Los Angeles, California area. It was founded by a group of respected professional musicians and educators. The company has developed and refined an accelerated teaching framework for guitar instruction and will release a variety of new products in 2018.